This post is a “prequel” to our first post: Re-thinking Things: How We Got Here. It tells about the time between when we first felt led to get out of the suburbs, and when we actually moved into our old farmhouse. So, for some time now, we’ve felt a very strong urge to get out of the suburb where we’ve lived for over 15 years. As we wait and see when and where the Lord leads us to move, we are starting to implement some of the homesteading stuff we’ve learned now, even in our suburbia neighborhood. 1. To eliminate processed foods almost entirely. 2. To be as self-sufficient as possible in producing our own food. We realize that here in the land of the 6-month-long winter, this will take some doing, so we’re starting slow as not to get too overwhelmed. Although we’ve been blessed with an early spring, most people are not comfy enough to start planting yet, so, we’re working on ways to expand our 4′ x 6′ garden without tearing up the yard too much. Our kid-friendly yard will be a good resale factor when we move, so we want to keep it largely intact. We’ll expand somewhat by planting along the back wall of the house, where we get the most sun. We’re also going to add some large planters for tomatoes on the deck. 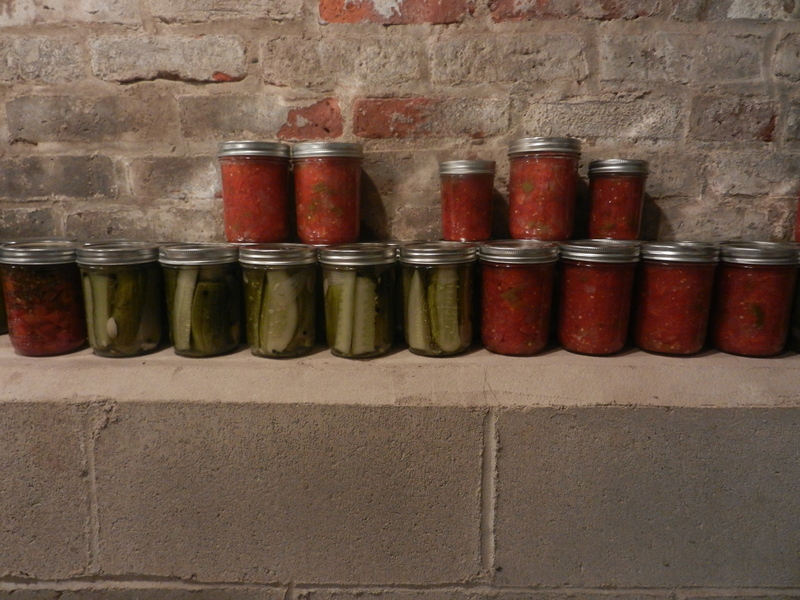 The plan right now is to expand our dill pickle canning, and do additional canning for tomatoes, salsa and spaghetti sauce. I’ve only done fresh/refrigerated pickles, but luckily I’ve got friends with canning experience. :-). We’ve also started our conversion to whole foods and away from processed foods. I made homemade refried beans and mexican rice tonite. The girls politely tolerated it (I think my recipes need a little more kick), but our son, who’s been on straight veggies, fruits and nuts since Sunday (we’re trying to pinpoint a food intolerance) was thrilled! It was a feast in his eyes! I’ve run through the gamut of emotions since the Lord led me a few weeks back to start researching homesteading and along with it, start providing our own whole foods to eat. There are days when I’m excited and eager for our new, simpler, healthier lifestyle. And then there are days when I’m scared, wondering why the Lord is leading us down this path of self-sufficiency. Today was one of those days of fear. I woke up, headed down for morning prayer, and had myself a good, long cry. Later, when I went up for breakfast, one of our 3 girls asked me to read her a devotional we’d gotten in the mail that I hadn’t gotten around to. The message was clear, and in God’s perfect timing: Look to Me, not to the world, for your help. Trust in Me with all your heart, listen to My voice, do what I say. The changes that God is leading us to make are all good changes, so the best plan, I guess, is just to rest in that truth.